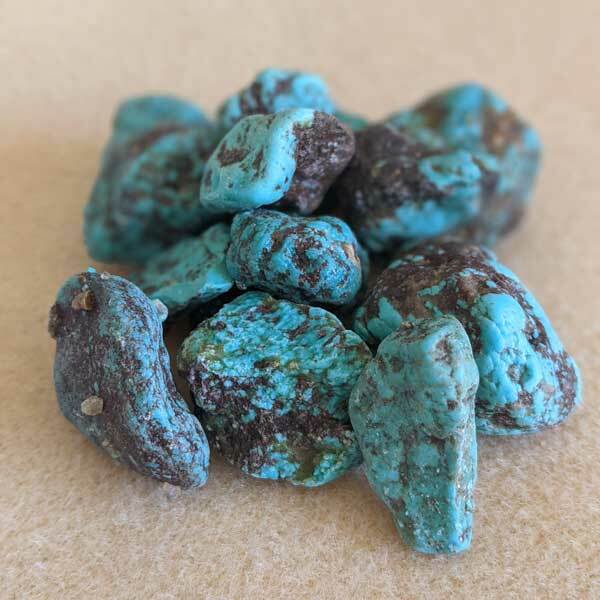 Turquoise healing tumbled stones that have come from an area in Arizona. Sizes and shapes vary. 3/8 to 3/4 inch in size. Their colors vary slightly, with most being a robin's egg blue. Turquoise aids us in recognizing the causes of fate that we have created for ourselves and the results we feel. Simply, it brings us the awareness that we really are the creators of our own "luck". It is a healer of the spirit and provides a soothing energy and peace of mind. Turquoise, while most beneficial to the 3rd, or Solar Plexus Chakra, strengthens and aligns all Chakras. It heals past life and this life blocks in the Throat Chakra, opens, heals and releases current and past life fear and grief. It connects physical and spiritual awareness, develops inner strength and calm, and heals emotions and the emotional body. 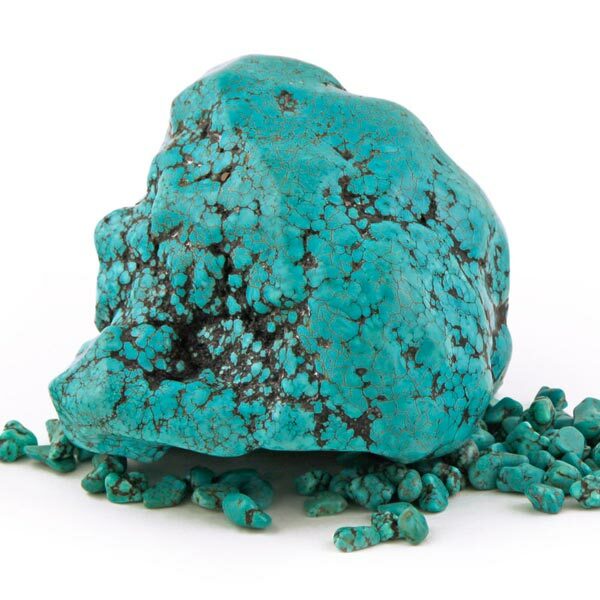 Turquoise has a Triclinic crystal system and is in the mineral class of phosphate. It is formed in a sedimentary manner as fillings in clefts. When solutions containing copper react with rock rich in aluminum phosphates, this beautiful stone is the result. Depending on where it was formed, its coloring ranges from sky blue to aqua and green at times shades of yellow (varieties from Asia). A relatively common stone, it is found all over the world. The bluest forms come from the US and northern Mexico. A more aqua colored variety comes from Persia where it is actually their national stone. In many cultures it is used for protection from spells and worn as amulets to warn the wearer of threats of danger. Yellow-green forms are now coming from areas in the middle east which does not contain as much copper. It is the copper that provides the blue and green colors most are familiar with. Like most stones, it is most beneficial when worn or laid upon the body. This one lends itself well to being worn on the solar plexus. Turquoise balances extremes in our moods and dissolves apathetic, self-martyring attitudes. It can refresh us when we're tired or exhausted and protects from being sensitive to outside influences. Turquoise brings an inner calm but allows us to be mentally wide awake and ready to act. It encourages good intuition and foresight. Turquoise can neutralize over-acidity and alleviate rheumatism, gout, stomach problems and viral infections. It has the ability to regenerate and stimulate brain activity and sensory perception, and has anti-inflammatory and detoxifying effects. Turquoise has a special affinity with Sagittarius, Pisces and Scorpio. Its Energy is Receptive, Planets are Venus and Neptune, and its Element is Earth. It is a good stone for artists, those in management, politicians and teachers. Turquoise was common in ancient Egypt and had been known as Callais. Turks believed it protected horses from overheating and falls and attached it to their bridles as amulets. In the early 17th century, no man considered himself to be well adorned unless he wore fine Turquoise. Turquoise has been important to Native American's for a long time. Indian legend suggests that medicine men would only receive proper recognition when they possessed it. When fixed to a bow it helped warriors and hunters become accurate marksmen. And legend has it that a man who could go to the end of a rainbow and dig in the earth would find Turquoise.